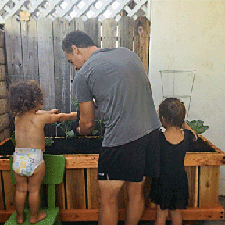 Every RollingPlanter is a raised bed planter. Raised bed planters make gardening more accessible for avid, beginning and physically challenged gardener. The standard RollingPlanters allow, for most part, gardening to be performed from a stool, chair, kneeling or if desired, a comfortable standing position. Deeper cavity RollingPlanters are made for growing trees, while other planters are made for boundaries for commercial establishments, privacy walls, balconies and rooftops. RollingPlanters have non-marking lockable commercial quality wheels. The wheels are 3 inches tall. The height enables them to easily transverse thresholds and other small obstructionsin their path. Optional wheel heights and types are optionally available to adjust the planters ability to roll over almost any terrain. Compact: In small urban plots, where one has little room or lack of good soil, the planters allow small hard surfaced areas to be transformed into productive gardens. Tasty Food: Vegetables and fruits taste better when they are allow to ripen naturally on the vine. Naturally ripen food provides more nutrients and enzymes our bodies need. Environment: Growing your own food allows you to know exactly which pesticides (preferably not), fertilizers, soil, seed stock used. Many vegetables, herbs, berries and fruits are grown in places far from where we live. By growing your food “locally” you’re also reducing the carbon foot print. 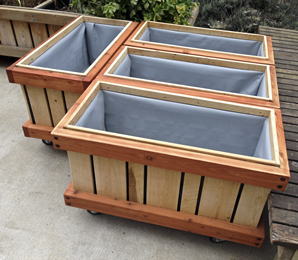 Mobility: Move planters to different positions on your hard surfaces. Heavy duty commercial grade locking casters allow for easy movement and mobility. This mobility allows areas to be quickly converted and used for social, sport, parking, and other activities. Waste Management: Provides a means to use garden and kitchen scraps (non-meat and dairy) as compost. By composting one lessens the chance for landfills to fill up and provides healthier soil that is alive with enzymes, beneficial bacteria and fungi that are beneficial to plant growth.. Many do not want to be deprived access to their garden patches. Gardening offers great exercise and can become a great hobby or even occupation. There is a true joy to watch flowers, plants, vegetable, herbs and fruit grow. Growing plants can be like raising pets. They help reduce stress, improve concentration, provides mental stimulation, offers award of accomplishment and provide other psychological benefits.People feel a huge sense of achievement and take great pleasure in watching their seedlings/plants grow. *Psychology Today, Jonathan Kaplan, Ph.D.
All RollingPlanters are mobile, unless the fixed position option is chosen. The planters come in standard width and length configurations of: 16 x 35" to 4 x 8.' Standard height is 25." Custom sizes are available. All planters are fully or nearly fully assembled. 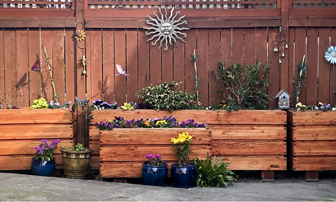 Most planters are made from “new growth” sustainable forest lumber that is either certified by the FSC, Forest Stewardship Council, or by the SFI, Sustainable Forest Initiative. 50% of the lumber is rough sawn cedar planks (When possible RollingPlanter will use recycled materials). Cedar planks are used for the side panels of the "Vertical" style planter.. The "Horizontal" style sides and frame, a s the"Vertical" style frames are made from Douglas fir. Kiln dried Douglas fir is cut into strips and laminated together, planed and then sanded. Douglas fir is used on the chassis, pedestals and any other structural or stress . Cedar is not a strong structural wood. To make a box strong, rigid and able to withstand the stresses of movement we use fir. The boards and planks are handsomely bolted or screwed together (We do not use flimsy rods, clips, pegs, nails or staples. The planters hardware is made of case hardened steel coated with a heavy epoxy or ceramic finishes to resist weather, moisture and corrosions). 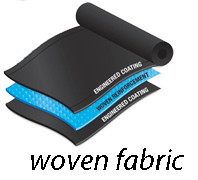 The interiors are lined with a heavy woven tri-ply fiberglass reinforced polyethylene liner resin fabric. Every box is plumbed with special hardware for drainage. The hardware is designed that tubing may be attached to direct over water spillage to other plants or containers (prevents water stains and promotes conservation). The boxes are easily moved without soil and in most cases, even when soil and plants have been added. The mobility of the full planter depends on the slope and the surface material and planter size. The wheels are industrial quality and NSF certified. Last, all wheels are securely bolted and installed with a strong locking mechanisms. Vertical Style is our classic design. RollingPlanter started with this look. Vertical means that the boards run vertical between top and bottom frame. The vertical boards are made from cedar. Its a great look, but for some it is not. So we made a "Horizontal" style. The Horizontal Style the boards run simply horizontal. The board construction is built like the frame: strips of kiln dried Douglas fir are laminated to make structural boards. The boards are fastened together with chinking between. Its another attractive RollingPlanter. We have designed and developed rolling raised bed planters for people with special needs or have been restricted by certain handicaps or injuries. 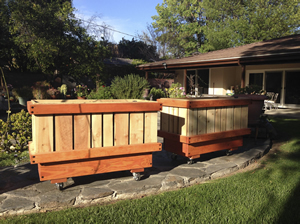 By providing taller planters rollingplanter has eliminated the need for one to bend over or rise. Planters can be made for people using wheel chairs, walkers, and other mobility devices. Currently we offer pedestal planters at 32" tall. Pedestal planters can be made at custom height between 20 and 42." These size eliminate t he need to bend and rise frequently, thereby protecting bones and muscles from strain and injury. All our planter can be provided without wheels. We do not offer a planter without a bottom. Bottomless planters in general do not last as long as those which do have a bottom and are lined. A bottomless planter is always subjected to the elements. Rot occurs because part of the box's wood is always exposed. Boxes like this last three to five years in most parts. The planters last less time, if they were built with staples, nails or other flimsy hardware. Our main concern associated with bottomless planters is that this type of planter allows unwanted pest as shrews, gophers, woodchucks, rats, mice and other ground burrowing animals to enter your garden oasis without detection. By the time you have discovered them they have harvested your plot or made most of your food inedible. Our planters are provided with a sturdy unequal constructed floors, a flood that is impossible for any unwanted critters to penetrate. Our planters wooden feet never touch the earth's surface. We have designed large solid blocks of plastic that are securely anchored on the bottom of each planter. These plastic blocks are thick and provide a genuine barrier from ground elements. The plastic is so strong and thick it apparently acts like Teflon. We have heard that our fixed position planters are nearly as mobile with these blocks as those with wheels; of course, we did not design the planters to be used this way. With bottoms our planters conserve water. Instead of watering the ground you are watering the planter and the plants you are growing within it. You do have to mulch in order to slow surface evaporation. One finds, especially in the western and southern United States, that we have to be concerned about water use. Droughts and water restrictions are going to become more important issues. We must concern ourself with this problem now and in the future. We must learn how to conserve water. As the rolling and the pedestal planter, these planter use the same construction methods, materials and drainage system. This planter system was developed for our Rooftop and Small Space Enthusiasts Great for restaurants and urban patios that need shade and privacy screening. The Trellis System is designed for our 2.5.' 3,' 4' and 6 long planters. Its 7' tall and sturdy. Provides a structure to grow vine vegetable, such as: cucumbers, beans, tomatoes; and the strength to providing a path for espalier trees and woody vines. The Vertical Planter Systems are designed for almost all or planters excluding CAFE models. 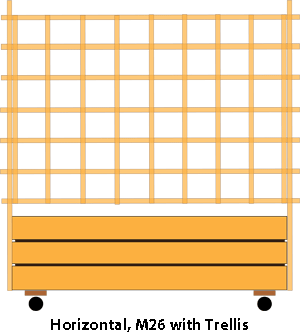 Three tiers of shelves can be hung on adjustable supports or one can use all the supports of part to make a privacy screen. 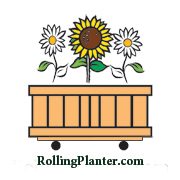 RollingPlanter provide two types of hanging boxes: 7.5 inches tall and 15.5 inches tall. The taller boxes are made so tomatoes and other vine growing plants can cascade downward and provide shade to plants that require shade. Not only do boxes and hang on the supports now called rails, but so do vines. The rail and vines growth provide a privacy screen. 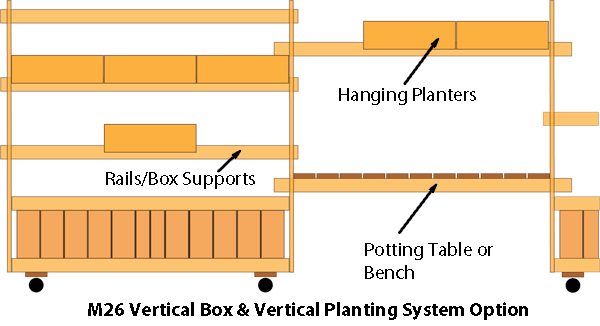 In addition to supporting boxed shelf planters, we have developed a bench/potting table that can hung between planters. Likewise, planters that are too short in length can still support the hanging planters, rails, bench or table. One thing RollingPlanter does not want you to do is to compromise the 20 mil liner. Should the liner be compromised, part the planter could be subject to rot and tarnish its appearance. You may ask why one would compromise a RollingPlanter. Most of the time we have found a person desires to put a planter on a timed watering device. They run some irrigation lines to the box and to bring them into the box they drill. The person who is drilling is a gardener and gardeners are not carpenters, should we say more. RollingPlanter provides these channels so irrigation line tubes can be installed at the time of setup or much later. You as the customer must decide at the time of purchase whether you want this option. We call these channels a snorkel. Our channel is large enough to change tubes out when they become dysfunctional and permit tubes up to 1/2" in diameter to fed through. Another watering option is our Self Watering Option. The self watering option is an underground cavern that provided by porous cavity we make an offer. It allows water to held in the below surface cavern and by natural capillary action of the soil delivers the water into the growing medium keeping your planters contents constantly moist. An overflow drain is provided on the bottom of the planter and two filling accesses are on the top of the planter box. One access has an overflow warning mechanism and the other is just an filling intake for the water. After the planter is filled with soil and the reservoir is filled with water, one will not have water your planter for up to two weeks or more. This method is great for drought areas, for the soil evaporation rates is much lower than conventional irrigation. Provides better tasting vegetables than hydroponics and more. Another watering option is turning the RollingPlanter into a small pond. Any planter can be converted into a pond by simply plugging the planters drains. We provide such plugs or you can purchase these at your local hardware store. The standard finish of the RollingPlanter is natural. The surfaces are filled and sanded and they are paint or oil ready. We do not believe in paint for paint requires much upkeep to keep in attractive. Rather, we believe in oil, first and stain as second. 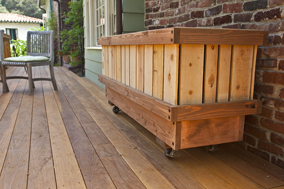 RollingPlanter can oil your boxes or stain them with a transparent stain. Full pigment stains are not used(RollingPlanter wants the wood to show). There are nine stain color options: White, Light Grey, Dark Grey, Black, Dark Blue, Dark Green, Light Brown, Dark Brown and Oiled Natural. The stains are a mixture of Canola oil (Rapeseed Oil), boric acid and iron oxide. There are no harmful chemical or toxins in the stain. Rapeseed Oil is used because from the time of the Industrial Revolution it was known to be the most penetrating oil. Boric acid is used to guard against boring insects, such as termites and beetles. The swatches below are the solid pigment value. All stains are transparent. The wood veins and texture will alter the appearance. 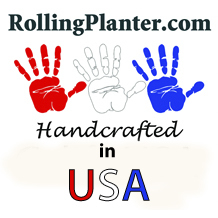 To place an order for your RollingPlanter you first need to download our CATALOG/PRICE LIST and ORDER FORM. In order to view the price list, you will need to have Adobe Acrobat plug-in installed into your browser. If you do not have it installed, please download a copy by pressing the Adobe Reader icon. 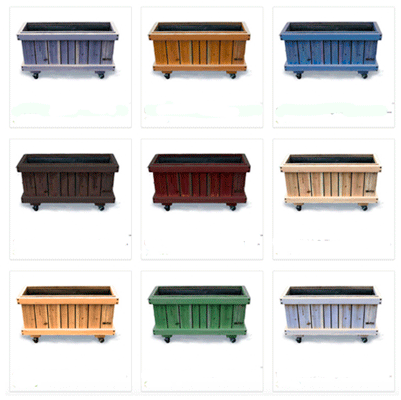 After reviewing the CATALOG/PRICE LIST, you then you can either press- PURCHASE NOW for our small planters that ship by UPS. For custom orders or for larger planters that must ship LTL, Less Than Truckload, Press the ORDER FORM button. Please note all LTL orders require a $650 order minimum. Complete the order form and either call it or send it in to us. For those who live in Southern California you can pick up your orders at our shop in Ventura. Please note, stock on hand is minimum. Most planters are made to order and require a minimum of three weeks to construct and ship. (ALL PLANTERS ARE HANDMADE). In order to view the price list, you will need to have Adobe Acrobat plug-in installed into your browser. If you do not have it installed, please download a copy by pressing the Adobe Reader icon below. Do note, most computers browsers are pre-installed with this software.